Presiding Officer Norma L. Gonsalves recently attended Boy Scout Troop 557 Eagle Court of Honor for Aaron Plass which was held at Temple Beth Am in Merrick. Aaron, a resident of Merrick, undertook a project to renovate the Youth League and refinish a podium and portable ark which are used for many summer services at Temple Beth Am, his local synagogue. He organized over 90 volunteers and logged over 350 man-hours to complete his task. 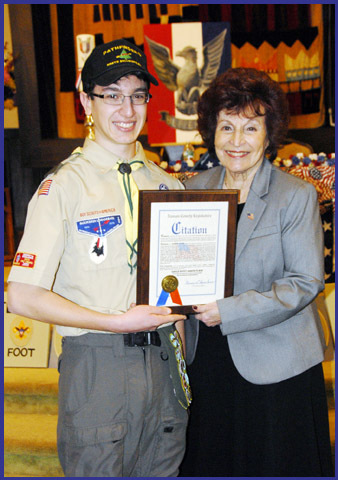 Pictured (l-r): Eagle Scout Aaron Plass and Presiding Officer Norma Gonsalves.